If you’ve ever read Marshal McLuhan he is one of those thinkers that you find yourself constantly returning to. Why? Because his ideas make a lot of sense, and in terms of how the internet works, they seem extremely prescient. The medium is the message is an idea that promote study of the medium through which something is communicated, rather than studying the actual content. So you wouldn’t be asking what the pages of data on the web mean, you would instead be asking what does the internet mean? How does the medium of internet affect social interaction and the way that we use information. For an analogy, you might want to be consider the way in which music has been affected by the medium through which it is communicated. When we had 45s or singles, that was the way in which people bought and thought about music; their conversation fell into patterns determined by those black plastic discs, talking of songs and b-sides. Change the technology a little and bump it up to extended plays and the focus of the conversation shifts. It moved from that to albums and the canvas that artists painted on, and the experience people had and talked about was altered yet again. Cassette tapes liberated the music from set formats and freed people up to more easily compile their own play lists and swap their music around, and the water cooler conversations mutated. CDs increased capacity and the album became resurgent. MP3s came along and they atomized albums and reconfigured the listening experience into something more closely resembling singles again, and the song rather than the collection became the currency of communication about music again. The internet has gone through similar iterations, and it is likely to continue doing so as the technology evolves. The way things are packaged is going to go through that whole move from single covers to album covers, to cassette album packaging, to CDs, and on to thumbnails and screensavers, etc for MP3s. We have seen mainly text, flash sites, custom built html, out-of-the-box platforms like Blogger and WordPress, and the more recent impact of tablets and phones on how we view the information we are wanting to experience. Warren Ellis in his Esquire technology column was talking about the decline of the watch industry brought about by phones being used by people to tell the time, and the possible revival with the advent of the smart watch. Blockbuster underwent an extinction event because of Netflix and services like it. Amazon did a good job of ushering in the demise of a lot of brick and mortar stores. Citizen journalism in a lot of ways supplanted traditional newspapers. Whole infrastructures have been knocked around and put under pressure by the enforced changes that the internet, those who have adapted to it, and those who have been born knowing nothing else, and the way this affects the message. Because all of this has been caused in some way by how we frame the world using whatever media devices we view it on. Advertising, PR and marketing evolves in the same way as the content does, but it is rarely the content that drives the change. Caxton’s printing press altered how information was disseminated forever – suddenly you don’t have to have some monk going blind copying manuscripts by hand; and before that the change that the written word brought meant you didn’t have to totally rely on word of mouth. These things never totally die off, as the millennialists would have you believe, but they are forced to repurpose themselves and find new meaning in the way that they are used. Typewriters garner novelty value; bookshops incorporate coffee shops and internet access; the selling medium reconfigures itself to deliver the message in a new landscape. 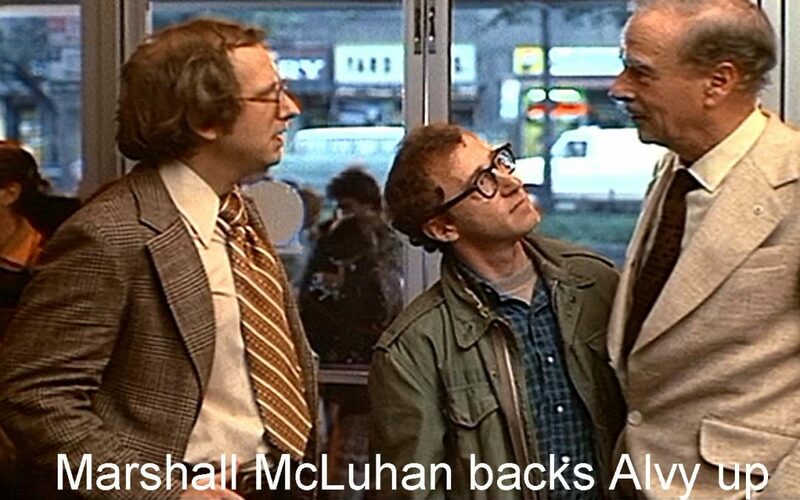 If you disagree with any of this I unfortunately cannot pull an Alvy Singer in Annie Hall and have Marshal Mcluhan step out of nowhere and back up anything I am saying, but you could go Google him. How we use information now isn’t the same as how we used to use it – we access it on our phones, our tablets, our laptops, whatever handheld we have. Our world is not the same because our media is not the same. What does this mean for advertising? It means it has to adapt. The basic principles of how the content is assembled holds true, same now as it did when the guys on Madison Avenue were selling cigarettes way back when, but the presentation has shifted to encompass how you look at it on your device. What next? Wearable tech like smart clothing, retinal implants, intelligent digital tattoos? The range of possibilities is endless, and will most likely include something totally unexpected. The cool thing is that the probability wave doesn’t just collapse into a single pathway like they used to claim – that old jazz of linear time; we have multiple choices to make and we live in a super-positional universe where the choices are quantum now and not binary. I learned to count on an abacus, and I remember the first calculators hitting schools in 1981 when we got Texas Instruments calculators; then it was solar calculators; and by the time I left primary school we had computers (basic, but a lot further along). College we had PCs and Macs and a lot more capability, and the rumblings about the information superhighway were pretty exciting. Jump forward to now and things which would have amazed my younger self are now commonplace. I carry around in my pocket a piece of technology I would have at one point had to drag around in a trailer. Do you think this has affected the message? Yes, Marshal, the medium is the message. The premise is interesting, and probably correct, but the last thought that “the medium is the message” creates a fundamental disagreement between philosophies. Aristotelian thought for instance declares that there is no message that cannot be phrased with words so articulately that its meaning cannot be obfuscated. Personally, I agree with Aristotle. The medium is irrelevant. It is the message that really communicates. I could say that I support genocide of all forms, and I am willing to lay a heavy bet that most people living in our society would fundamentally disagree with the *message* that genocide is ok. How I deliver this message, whether over the phone, through an e-mail, a blog post, an academic article supporting it, or any other form of advertising: I am positive that the majority of society would have qualms about the *message*. Sure, not all messages are so drastic, but I chose this to serve a point. Aristotelean thought declares that words (ergo messages) are the things that must necessitate communication, not how they are delivered to others.